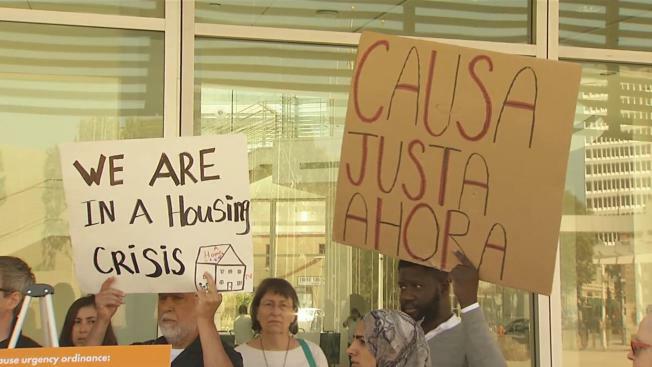 The San Jose City Council on Tuesday night voted 9-2 to pass an urgency ordinance protecting renters in the city. The vote means an ordinance against no-cause evictions recently passed by the council goes into effect immediately instead of next month, preventing landlords from scrambling to force no-cause evictions before the originally set June 22 implementation date. 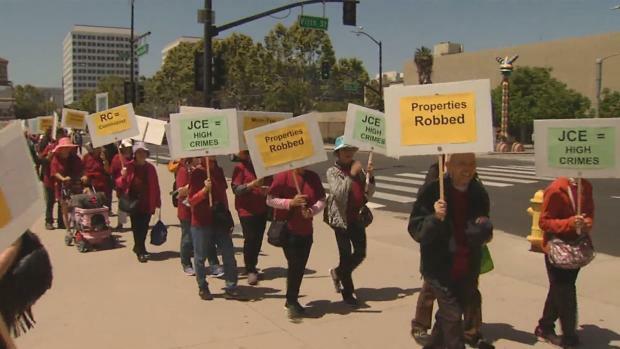 Landlords in San Jose rallied earlier Tuesday against the city's "just cause" eviction ordinance. A group of landlords who participated in a demonstration in San Jose said they do not want restrictions on evicting tenants. Meanwhile, renters who were asking for immediate implementation of the tenant protection ordinance recently approved by the city council got their wish. Landlords in San Jose rallied Tuesday against the city implementing its "just cause" eviction ordinance. Mark Matthews reports. Supporters of the ordinance claim a delay could have given unscrupulous landlords the opening to rush the no-cause evictions. Lawyers that handle reports of evictions without cause said they have already seen an increase in complaints in the past three weeks. Rents are rising so fast in San Jose, tenants say they’re getting evicted because landlords want to raise the rent more than the 5 percent per year that they’re allowed under the current rent control rules. "Just because they want to increase the price of the rent on the property, they give you a no-cause notice, and then the next thing you know, you’re in the streets," said resident Salvador Bustamante, who is a member of a Renters Rights Coalition. Mayor Sam Liccarado said earlier Tuesday he supported the emergency implementation, and he believed the council would too. "I expect the council will strongly support moving forward to ensure that we can avoid the spike in evictions that could result if this law were about to be in effect," he said before the vote.